There are few farmers more knowledgeable of Practical Systems’ Cashbook Platinum program than Wellington grazier and Cashbook trainer, Lachlan Campbell. While he acknowledges that the Advanced Cashbook Platinum is well suited to those who have a fundamental understanding of basic accounting concepts, he says that getting educated about the program can be one of the most powerful achievements in a farming business. Mr Campbell and his wife, Teena, farm 6880 hectares of grazing country at “Bonada”, Wellington, in conjunction with Mr Campbell’s brother and sister-in-law. Mr Campbell started using Cashbook Platinum five years ago and through his role as a business coach for agricultural consulting firm, PrincipleFocus, he has gone on to train more than 50 farm business owners to use Cashbooks, on a one-on-one basis. “It’s an all-encompassing program that monitors and manages your balance sheet, and monitors asset performance,” he said. Mr Campbell said anything worthwhile involved hard work and people needed to be prepared to put time into learning how to use the program, so they could accurately monitor the performance of their farming business. 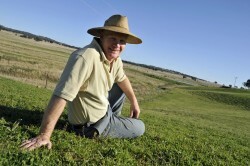 When not training farming families about how to use Cashbook Platinum, Mr Campbell works on the family’s large-scale grazing property, where they run a sheep and cattle breeding and trading operation.